I’m not a massive chocolate demon. I do like it, but thankfully, it’s never been something I crave or gorge myself on. Once in a while, I eat a chocolate pudding that makes me grateful I don’t have this chocolate ‘gene’. 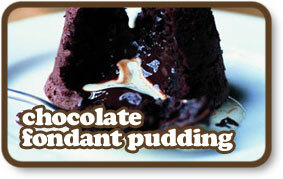 This fondant pudding is totally sublime. This little cake delivers a dreamy warm choco fondant inside. It’s deliciously rich. I is also definitely a once in a while treat – too many of these and you’ll end up the size of Oprah. Incidentally, these are perfect dinner party puds. You can make them up to 12 hours in advance. Which will save you a nervous breakdown when your guests are hovering around your kitchen, getting on your nerves. Beat together in a large bowl the eggs, sugar, egg yolk and orange zest into a creamy paste. Set aside. Place a bowl over a pan of lightly simmering water. Melt the butter and chocolate in the bowl. Take bowl off the pan and add the egg/sugar mixture and stir well. Sieve in the flour, baking powder and cocoa powder and fold this into the mixture. Cover and leave to settle for 1 hour. Brush with butter 6 ramekins and then dust with cocoa powder. Spoon the rested cake mix evenly into each of the ramekins. Arrange on a plate, cover with film and refrigerate for a minimum of 3 hours. Preheat the oven to 180ºC and bake the puddings for 8-10 minutes. The sponge should be just set. Cool briefly, then serve. Serve with a little cream, or dusted with a little icing sugar and fresh fruit such as raspberries or strawberries.